Well it looks like we survived another Super Bowl Sunday yesterday! From the pre-game shows to football to the half-time show to the commercials, it sure makes for a long day, so hopefully you survived it as well! Jan and I had a nice quiet party with snacks and adult beverages and were able to avoid all the drunk crazy fans out and about at some of the local watering holes! The other good thing about being at home is having any kind of issues with the police who had said coming into the weekend that they were really going to crack down on DWI’s! Safe and sound is always a very good thing! We had a very nice shoot last week with our friends over at Methodist College here in Peoria. For those of you that are unfamiliar with Methodist College, they train nursing students and they graduate with a degree in nursing. They’ve been located downtown for a number of years now and the good news for them is that they purchased the American TV store out on Route 150 here in Peoria and will be moving into it sometime this summer. Renovations are under way as we speak and it sounds like it’s going to be a heck of a facility. For this shoot, Methodist College needed to get some new photos of the students for up coming brochures and their web site and they had a big challenge for us as well. They wanted us to minimize the background in the photos to hid the current facility so that these photos could be relevant for the new facility next fall! Needless to say it takes a little bit of creativity to try and hid the background and make it as non-descript as possible! The good news for us is that we were able to come away with some great photos that we are sharing today! Here’s a few of the images that we captured for Methodist College! It’s time for us to get to work, so we hope that you’re going to have a great week and thanks for checking out our work! Monday morning greetings to one and all!!!! One of the video projects that we have been working on has finally gone on the air and we can share it with you today. Back in August we spent the day shooting video for our friends at Spoon River College in Canton, Il. We had a great day to be shooting with the weather and as you know that’s always a huge thing with me. It was one of the first days that the “kids” were back in school and everyone was happy to be back. The concept behind the commercial was to feature three different adults that had gone back to school and received their degrees and that’s a big market for colleges like SRC in today’s world. Besides shooting the interviews, we also shot some “B” roll video of some of the different activities going on at SRC to give a little taste of campus life. Besides shooting the video, we also did all the editing and the graphics work for this spot. I’m really proud of this commercial because we were able to do all of the production work ourselves. Here’s the new commercial for Spoon River College! 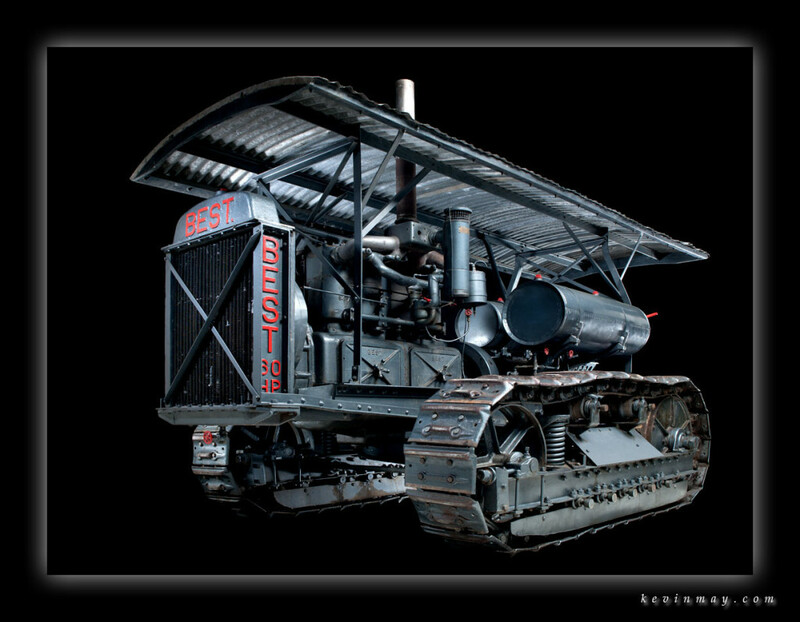 We hope that you have a great week as always and thanks again for taking the time to check out our work!!! Well we’ve sure had more then enough rain here in the Midwest these last few weeks. It seems like everyday day we are getting some rain and things are getting a little soggy! I ended getting my yard cut yesterday and normally I would wait for things to dry up before cutting it, but I saw a break in the weather for a few hours and thought I’d better get it done. The whole time that I was cutting it, the ground was wet and my shoes were nice and squishy! We’d love to send some of this water out to the West Coast where they don’t have enough!!! Back at the first of this year I made the announcement that we were starting to shoot some video for clients. I’ve been truly amazed at the number of projects that have rolled in this year. We just did another one last week where I was shooting video images and Jan was shooting still images for the client, so that was a lot of fun! We have learned so much in the past few months about the whole process and ways to do things better. There are technical things that we never had to deal with shooting still images and now we are learning about video. One of the biggest things that we’ve learned was getting better audio for a video commercial like the ones we’re sharing today. There was some trail and error in the beginning, but with the help of a incredible video mentor, we are getting things where they should be! These spots are a great example of that! We’ve been doing a series of TV commercials for our friends at Goldfine and Bowles. We learned so much about audio recording doing these commercials and ways that we could make it sound even better. Like anything else in life, we learn from our mistakes and try to not make them again! Here’s a couple of our new spots for Goldfine and Bowles! Thanks as always for checking out our work and we’ll keep rocking and we hope you will as well! Well we sure had quite the Sunday of weather in Central Illinois. In the afternoon the thunderstorms really heated up and the winds were rocking. I heard on the radio that about 10,000 Ameren customers were without power at some point yesterday, so that’s a pretty good storm! We were recently helping out our friends at UnityPoint with some photos. We were trying to show some of the projects that the UnityPoint Health – Methodist / Proctor Foundation has funded. One of the many projects was this project that we are featuring today. When a child is going in for some surgery at the hospital, there is a point where they have to leave the parents and head in for that surgery. This can be a little scary for the child to leave the safety of mom and dad, so to ease that anxiety they get them all “gowned up” and ready to go. 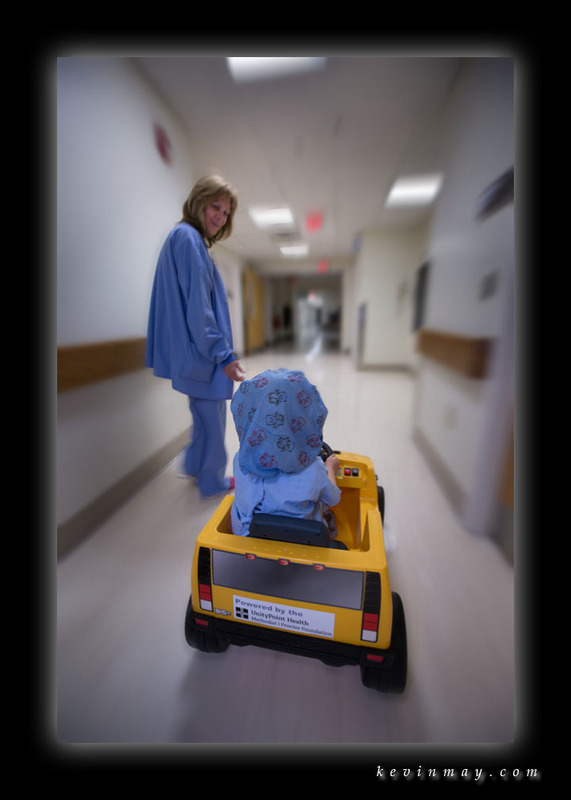 Once they do this, they have a couple of battery operated cars that the kids can drive to surgery. It might not sound like the biggest thing in the world, but it’s probably that little bit that makes things a little easier during what could be a very stressful time for the child. The one funny back story to this shoot was that we had three sisters aged 7 to 4 and we were going to have the oldest one drive this little yellow Hummer for us. Well as sometimes does happen, she got scared and didn’t want to do it. We then tried the middle sister and she wanted no part of it either and then on to the youngest sister and the same results. We ended up putting the youngest sister in the Hummer and the nurse pushed the gas peddle and as soon as the other sisters saw what was happening, they both couldn’t wait for their turn. I think we got this photo with the youngest sister, but we photographed all of them so they would each have a turn driving the Hummer. Sometimes when you think something isn’t going to work like this, you get lucky and get the shot that you’re after! Here’s one of our photos from this great project that was funded by the UnityPoint Health – Methodist / Proctor Foundation. We hope that you’re going to have a great and thanks for taking the time to check out our work! Jan and I are rocking and rolling as always and things have been pretty darn busy of late and we can’t complain about that! One of the things that I’ve always enjoy seeing is live music! It doesn’t matter what type of music it is, to see musicians playing live has a wonderful feel and there’s an energy that you get from them and their music. I can recall from my days here in Peoria when I was going to Bradley University, a bunch of us would get out to the Second Chance (for those from the Peoria area and also old enough to remember that place) and catch some local and regional bands. It was a great venue to see bands and I really miss the place! Well not to fear, it looks like we’ve got a place here in Peoria that’s fitting the bill as a local place to see live music. The Limelight is a entertainment complex on the North side of Peoria and it’s a great venue to catch live music. I was there for the first time yesterday for a “Generations” show with local bands from yesterday and today. My guys, The Rave who I’ve photographed for over 30 years and featured here on the blog were there and did a 10 song set of original music. Let me tell you from a photographic standpoint, 10 songs sounds like a lot of time to get photos, but it’s not! I was really banging the motor drive on the camera and trying to get as many images as I could in such a short amount of time! It was a great show and as always the guys rocked!!!! Here’s a few of my snaps of The Rave rocking the Limelight! Thanks as always for checking out the work and we hope that you have a great week! After my 25 years of shooting photography, when it comes to shooting photos of kids, you just never know how it’s going to work out! Now I could tell stories for hours and hours about shoots that didn’t happen or were a complete train wreck because we were working with young kids. Now it’s not that the kids were all bad or a problem, but depending on the age of the child, you usually have a very limited time to work with them. Most kids have a very limited attention span and the younger they are, the shorter their attention span can be! What I usually try to do when I know that I’m going to be working with children is to have everything set up (camera, lighting, etc.) so we can start shooting as soon as the child arrives on the set. I will always figure that I maybe have five minutes to work to get the shots I need and anything beyond that is a bonus! Last week we had a shoot at the Morton Unity Point Clinic and we were going to be shooting some photos of a young child with a pediatric doctor. Well we couldn’t have gotten more lucky, we had Dr. May Sun as our pediatrician and little Addison as our young patient. Dr. Sun was great with Addy and I can see why she is so highly regarded with the kids! Remember that five minute rule that I have when working with kids, heck I think we got a half hour or more out of Addison and that was great as well. Like I said, you just never know how much time you’re going to get, so you really have to work fast! 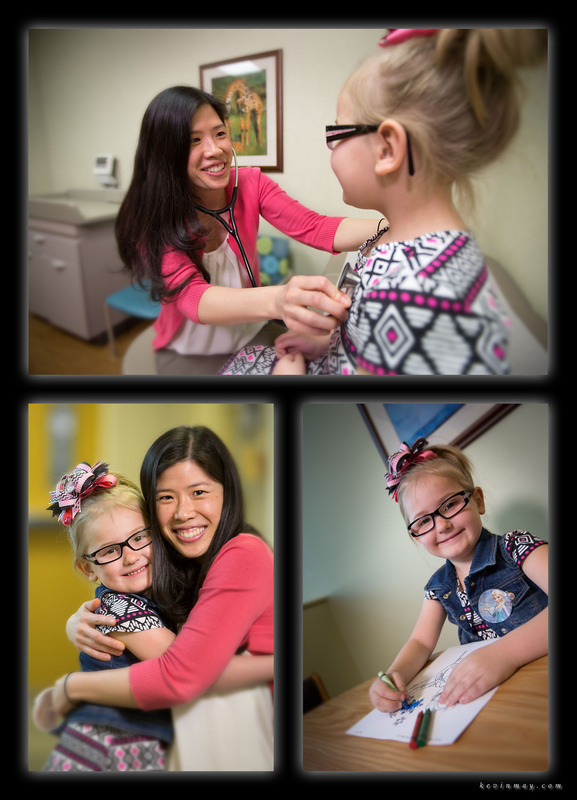 Here’s a few of our snaps with Dr. Sun and Addison! Thanks as always for checking out our work and we hope that you have a great week to come!!! Nighttime is the right time! Monday morning Des Monies greetings to one and all! We are headed back from a quick trip to Colorado for some advanced video training. It was a real banzai run these past few days. We got in the Explorer late Thursday afternoon arriving in Colorado on Friday afternoon. Saturday was spent getting more advanced techniques with the video camera and also some computer software lessons! Sunday morning we started back home and made it as far as Des Moines, Iowa and we’ll be back to P-Town ready to rock once again this afternoon! All and all, it was a great trip out West even if it was so incredibly brief, but lots of great information that will really help on future video projects!!! This past week we got rocking and rolling for 2015 with the first architecture shoot of the year. In Peoria with the snow and the lack of vegetation in the winter months, it makes no sense to be out there shooting photos of buildings when you can see things that you don’t want to see. When it comes to daytime photography of architecture in Central Illinois, we are still a good month or so away before things start to green up enough to make good photos. In the case of a night time shot in Peoria, we have hit the time of year when we can get started. Our friends at Unity Point Hospital in Peoria were needing some nighttime shots of both hospitals (Methodist and Proctor) and we had some perfect weather last Monday to be out shooting at night! Everything came together and we had a great sunset that topped off the shot! 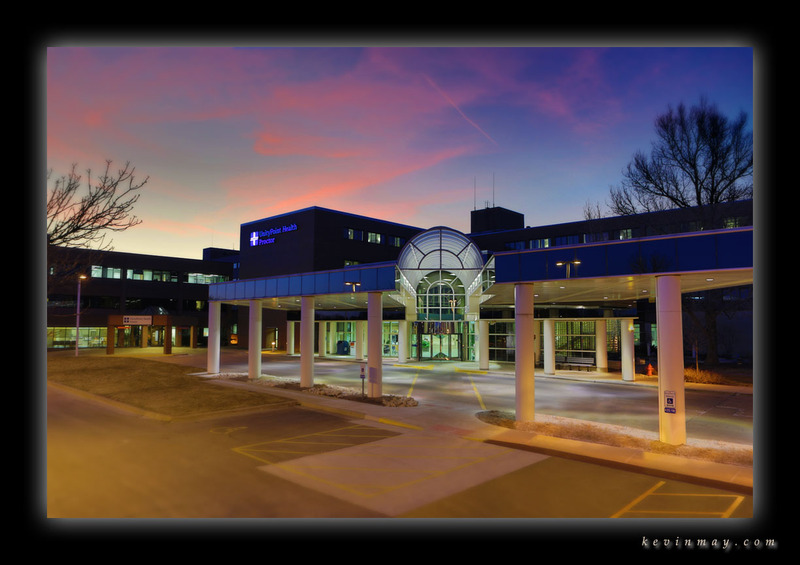 Here’s our photo of Unity Point Proctor Hospital at night! Well it’s time to get to work, so we hope that you both have a very wonderful week!!! Well there was big fun in Peoria this past Friday night! Dave Alwan from Echo Valley Meats was on the ABC television show “Shark Tank” for the second time in the past couple of years. The first time that Dave presented his idea to the “Sharks”, they rejected it, but the response for Echo Valley Meats was huge. The phones and internet started ringing with orders and this caught the attention of the producers of the show. They asked Dave to come back and pitch his idea one more time. Dave had all of his ducks in a row this time and had three of the sharks making him an offer and he choose the offer from Mark Cuban (NBA Dallas Mavericks owner) and now they are partners and that’s great! On Friday night when the show was going to air on tv, Echo Valley Meats had a big viewing party with over 100 guests. When the show came on, they projected the video on the wall for everyone to see. Dave came in and made his pitch to the sharks and when he announced on the show that he was teaming up with Mark Cuban, the whole room erupted with cheers and applause!!! Smiles and congratulations were in order and the party was on! The other thing that I thought was really cool is they had set up a computer and a big screen that was showing all the analytics on the Echo Valley Meats web site and the traffic that it was getting during and after the show! The amazing thing is that with-in 13 hours of the show airing on Friday night, the EVM web site had an additional one million hits to the site! It really shows you the power of a hit tv show like “Shark Tank”!! Here’s a few of the images from a great evening with Echo Valley Meats and their big news!!! We hope that you have a great week as always and thanks for checking out our work!